Ray gun fans, rejoice! The Airborne Laser Testbed (ALTB) took out a liquid-fueled ballistic missile from an airborne platform, according to the Missile Defense Agency. A modified Boeing 747-400F airframe fitted with a Northrop Grumman higher-energy laser and Lockheed Martin beam and fire control system [was used]. After an at-sea launch, the ALTB used a low-energy laser to track the target. 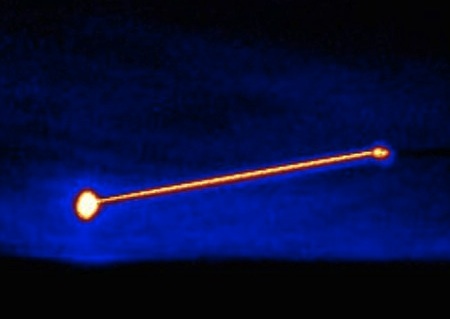 A second, low-energy laser was used to measure and compensate for atmospheric disturbances before the megawatt-class laser was fired, "heating the boosting ballistic missile to critical structural failure." If you enjoy this general topic, you'll like AESA Radars Used As 'Death Ray' Weapons? . Via Engadget; thanks to Winchell Chung for the tip on this story (I think).